A Musical Collaboration by Neil Douglas-Klotz, Abraham Sussman and Friends. This CD is a companion to the book The Genesis Meditations for listening, contemplation and movement. Voice, guitars, violin, hand drums, piano, flute, cello, bass, accordian, horns and harp. 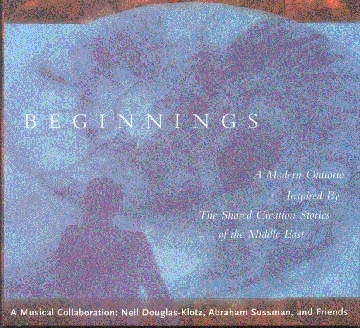 Once you have purchased this download, “Beginnings”, you may also purchase the physical CD for a special price of $5 plus shipping. To do this, please open the Purchase Receipt email which you will receive from this website soon after purchasing the download, and forward it, as proof of purchase, to: northeastsufis@gmail.com, requesting a copy of the CD. Abraham will then arrange payment and shipping with you, by email. This entry was posted on January 31, 2014 by Chris.